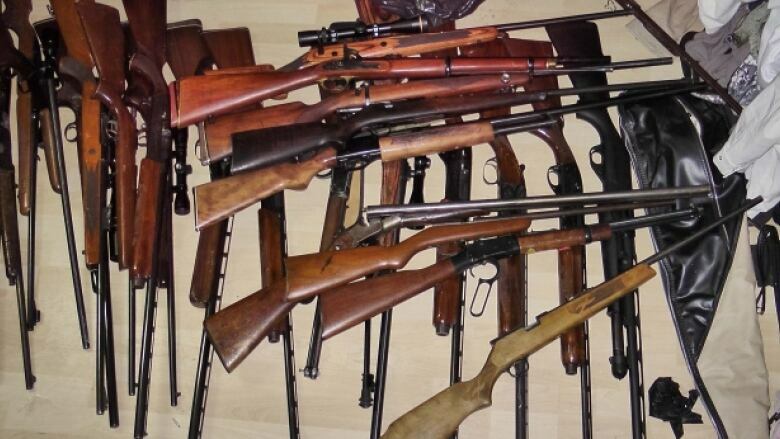 More than 10,000 guns are listed as missing or stolen in Alberta, and many of them are now in the hands of criminals, RCMP warn. More than 10,000 guns are listed as missing or stolen in Alberta, and many of them are now the hands of criminals, RCMP are warning. Last year alone, about 1,300 guns were reported stolen. That only includes guns stolen in areas of the province policed by the RCMP, so thefts in Edmonton and Calgary are not included. RCMP assistant commissioner Marlin Degrand said when he first started with the police force almost three decades ago, gun seizures were rare. "Now I can tell you that it's the very rare occasion where we don't seize guns in drug events and organized crime files," Degrand said. "If we don't see them, we're actually surprised." Since 2012, RCMP have seen stolen gun reports more than double across the province. That makes city streets and country roads less safe for everyone. "This kind of theft of firearms, which we know are now falling into the hands of criminals, being used by criminals, actually makes it quite a bit more dangerous," Degrand said, "not only for officers but for the general public. "When somebody brings a firearm into the equation - whether it be in something like a theft or a robbery - that elevates the risk immediately." More and more criminals carry guns these days, Degrand said, and most of those firearms were stolen from law-abiding citizens. "It's not through unlawful importation or shady deals across the border," he said. "That does still happen, but the majority of the firearms that we're seeing coming into the possession of criminals now are actually sourced through the theft from a lawful gun owner, like myself and the rest of Albertans." RCMP want to get that message out, and want gun owners to ensure their weapons are properly stored, and if stolen reported immediately. 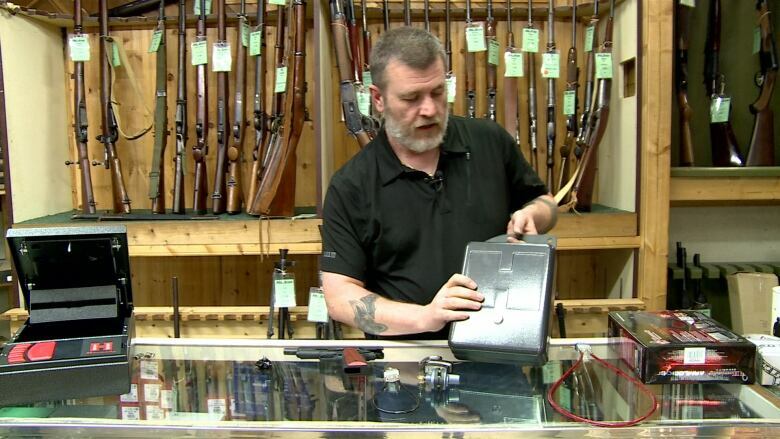 Gordon McGowan owns MilArm, an Edmonton company that sells guns and other hunting equipment. He said Canadian law requires that non-restricted guns - hunting rifles and shotguns for the most part - be safely stored, which means they must be rendered inoperable, kept from public view, and locked in a container or vault that's not easily broken into or carted away. Restricted firearms, which includes handguns and what are called "black" rifles, are by law required to be trigger-locked and stored in a locked container or vault. But McGowan said there's only so much gun owners can do to safeguard their weapons. The laws, he said, are mainly "geared towards reasonable deterrence, as opposed to physical prevention from it happening." To demonstrate, McGowan showed CBC two standard trigger locks. One, he said, would take a thief about 90 seconds to break out of the trigger guard. "This one," he said, holding up another model, "is two pair of plyers and about three seconds." He also showed a typical lock-box used to legally store a handgun. He said most gun thefts likely result from one of two scenarios. "The ones that we see and read about in the news are people who are not aware of the legislation, ignorant of the law, or choose to go around the law." The latter, he said, "typically are going to be more your rural types. They need quick access to a firearm for predator control. But most urbanites and most people coming in and out of the stores regularly are pretty well-versed on what's required." McGowan agrees that owners should immediately report gun thefts. And he had a warning of his own. "Especially when it comes to handguns or what we call 'black' guns. If this is out on the street and you're not telling somebody, if it goes sideways, if it's used in the commission of crime, you are the last known party to own that. The first finger of suspicion is going to point at you." "So, if you are aware that you've lost a restricted or a 'black' gun, the onus is on you to report to law enforcement post-haste."